Broadly defined, acute rhinosinusitis is an inflammatory condition of the nose and paranasal sinuses lasting up to 4 weeks . This straightforward definition does not take into account etiology, which is typically, but not always, infectious. Viruses and bacteria are the most common causes of acute rhinosinusitis, with both resulting from, as well as causing, mucosal thickening and trapped mucous secretions. As a result of the upper and lower airways typically reacting in concert, lower airway inflammation may also be a feature of acute upper airway inflammation. Treatment of acute rhinosinusitis, therefore, is aimed not only at causative organisms, but also at the associated inflammation and resulting symptoms. 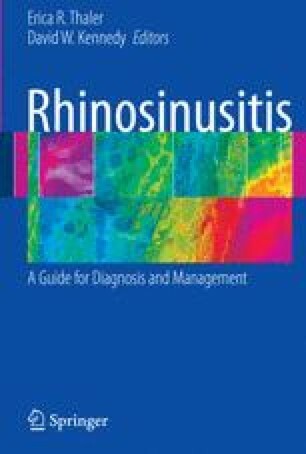 Acute rhinosinusitis in adults. 2005 [cited 2007]. Available from: http://cme.med.umich.edu/ pdf/guideline/rhino05.pdf. Respiratory Illness in Children and Adults (Guideline). 2007 [cited 2007]. Available from: http://www.icsi.org/guidelines_and_more/guidelines__order_sets___protocols/respiratory/ respiratory_illness_in_children_and_adults__guideline_/respiratory_illness_in_children_and_ adults__guideline__13110.html. Acute Bacterial Sinusitis Guideline Team CCsHMC. Evidence-based care guideline for management of acute bacterial sinusitis in children 1–17 years of age. 2006 [cited]. Available from: http://www.cincinnatichildrens.org/svc/alpha/h/health-policy/ev-based/sinus.htm.